Anthony Larholt, the Principal and owner of the Queens Road Clinic, is the most senior Osteopath practising in South Essex. Graduating from the British School of Osteopathy in 1969, he first worked with the late Walter Buchanan in Chelmsford before moving to Southend to start his own practice. He also worked for many years in Harley Street, running a successful practice in cooperation with several highly respected orthopaedic Surgeons and clinical physicians before deciding to concentrate his attentions to the people of South East Essex. As one of the Osteopaths involved in the setting up of the Statutory Regulating body for Osteopathy, he was involved in the passage of the Osteopaths Act, which set up the present regulatory body for Osteopathy, the General Osteopathic Council, of which he has been a member since its inauguration. 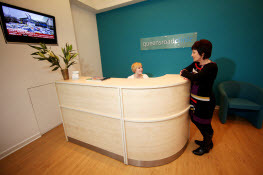 Anthony started in practice in Southend in 1970 in London Road, moving to the Queens Road in 1983 and opening the Queens Road Clinic, which he has recently extensively modernised and kept in line with modern technology and styles. He has always kept well up to date in his approach, both by regular attendance at courses and conferences, now a requirement of the GOsC, but also in his manner of practice and was one of the first practitioners to computerise his records and appointment system in 1994. At present, apart from maintaining his academic and technical skills to the highest levels, he is involved in the Pilot Study to investigate the practical approach to the Revalidation of Qualification and Fitness to Practice which all medical professionals are going to have to undergo over the next few years. Over the years he has been in practice he has seen a wide range of cases and conditions and this experience enables him to assist his patients in the true Osteopathic sense by helping them, where necessary, in their whole approach to life, or some part of it, be it by helping with diets or exercise, advising where to find assistance for many differing problems and situations and of course where he finds that there is a problem requiring medical attention ensuring that the patient is seen as quickly as possible and by the most appropriate physician or surgeon.